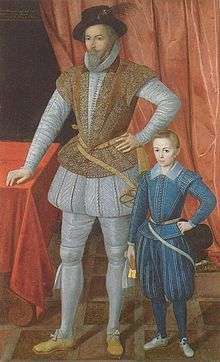 A jerkin is a man's short close-fitting jacket, made usually of light-coloured leather, and often without sleeves, worn over the doublet in the sixteenth and seventeenth centuries. The term is also applied to a similar sleeveless garment worn by the British Army in the 20th century. 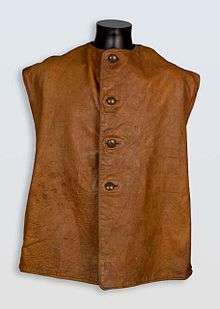 The stock phrase buff jerkin refers to an oiled oxhide jerkin, as worn by soldiers. The origin of the word is unknown. The Dutch word jurk, a child's frock, often taken as the source, is modern, and represents neither the sound nor the sense of the English word. Leather jerkins of the 16th century were often slashed and punched, both for decoration and to improve the fit. 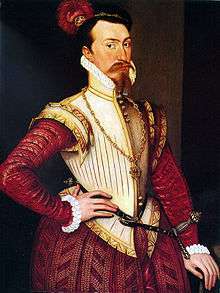 Jerkins were worn closed at the neck and hanging open over the peascod-bellied fashion of doublet. At the turn of the 17th century, the fashion was to wear the jerkin buttoned at the waist and open above to reflect the fashionable narrow-waisted silhouette. By the mid-17th century, jerkins were high-waisted and long-skirted like doublets of the period. During the First World War, the British army issued brown leather jerkins to the troops as a measure to protect against the cold but to allow freedom of movement. These garments generally had four buttons and were lined with khaki wool. They were practical, hardwearing and extremely appreciated by officers and other ranks alike. By the time of the Second World War, the leather jerkins were still on issue to all the Commonwealth forces and were universally popular. Jerkins made in Canada were dark brown with black wool linings and differed in general appearance from the British jerkins. The jerkins from the Second World War had bakelite buttons instead of the brass or brown leather of the originals, and were each unique in that they were finished around the bottom edges with offcuts in a bid to eliminate waste. (It has been suggested that many of the World War II jerkins were made up from leather left over from the Irvin flying jackets also in production in the UK - however, the flying jackets were made of sheepskin so this may not be the case). Jerkins remained warm and comfortable garments to wear whilst fighting, working or driving, and came to characterise the British forces as a preferred alternative to the heavy greatcoats that other armies persisted with. A practical garment known as the Battle Jerkin was developed in 1942 by Colonel Rivers-MacPherson of the British Army; a modification of the English hunting vest, it was developed into a garment made of leather (canvas versions were also created) with multiple pockets, intended to replace the conventional web gear then in use. It was issued to assault troops for the Normandy landings and was used widely by commando personnel in 1944–45. During the post war period, a much less distinctive PVC version was introduced to the forces. WD surplus leather jerkins flooded the UK during the 1950s and 1960s and were a common sight on manual workmen across the country. Wartime vintage leather jerkins are now collector's items, and at least one UK firm has produced a facsimile. The Belgian Army also produced vinyl jerkins in the postwar era. ↑ Chappell, Mike British Infantry Equipments 1908–1980 Men at Arms series, Osprey Publishing Ltd., London, UK.